Concord, NH – Today, the Governor’s School Safety Preparedness Taskforce presented Governor Sununu with their final report on safe schools, which comes after 90 days and more than 1,000 hours of research and discussion of the most pressing issues involving school safety and security. This report will help serve as a model across the country for other states looking to strengthen school safety. The taskforce conducted an incredibly comprehensive review of the state, local, and federal landscape, sought and evaluated public comments, visited schools, met with school administrators, staff, students and parents, and held discussions with local fire, police and first responders. The report identifies 59 taskforce recommendations, which will help the state of New Hampshire prioritize safety preparedness initiatives. 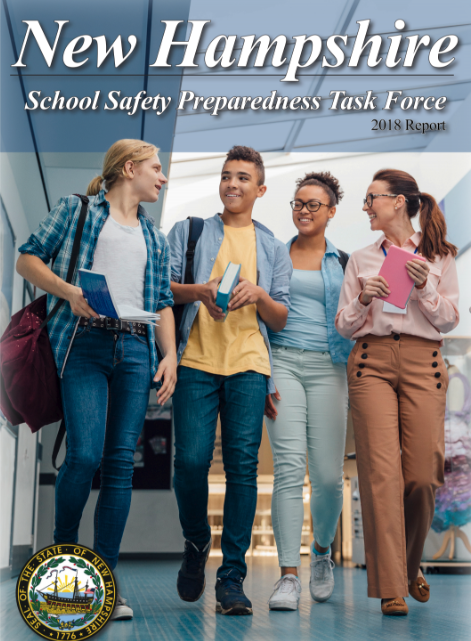 The taskforce was charged with providing practical, actionable recommendations from areas of agreement among taskforce members in order to provide state and local leaders, school administrators, students, parents, and first responders with the proper tools and recommendations to ensure New Hampshire schools are the safest in the nation. “I could not be more proud of this comprehensive report. An incredible amount of work has been done in a very short amount of time,” said Governor Chris Sununu. “One of the most important recommendations contained in this report is the need to expand social and emotional learning (SEL). Many schools have SEL programs in place, but these programs may not be robust enough to be effective in these challenging times. Programs have emerged that can be a tool for prevention not only for violence, but for addiction, suicide, and the toxic anxiety that has plagued our school children for too long,” continued Sununu. “I’ve had the honor of working with Scarlett Lewis, who is the mother of Jesse Lewis, victim of the Sandy Hook elementary school shooting. She is a national leader in social emotional learning and creator of the Choose Love movement. As a state, New Hampshire will provide a backbone of support through Scarlett‘s program to introduce social emotional learning curriculum. The School Safety Taskforce was comprised of a diverse group of Granite Staters representing: First responders, Police Chiefs, Fire Chiefs, SWAT Officers, school administrators, principals, teachers, School Resource Officers, parents, School Board Members, citizens, members of the National Guard, mental health professionals, homeland security officials, emergency management directors, intelligence professionals, communication professionals, and private businesses. Note: A copy of the report is attached.